The ancient City of Petra is located in the region known as “Ma’an” in Jordan. Petra is a word that is said to mean “Rock”. Petra is popular for many reasons, but there are two most distinctive characteristics make it the most popular. The first is that its architecture is rock cut and the second is that it has a massive system of water conduits. It is believed that the lost City of Petra was established in or around the 6th Century B.C and served as the capital for the people known as the “Nabataeans”. It is located to the south of the Capital of Jordan, which is identified as “Amman”. Throughout history, the ancient City of Petra has been considered to be one of the greatest unsolved mysteries of the world for several reasons and has recently been voted as one of the “New Seven Wonders of the World”. In this guide, you will learn why the lost City of Petra remains so popular among historians and others throughout the world. The ancient City of Petra is located in Jordan on the slope of the mountain known as “Mount Hor”. Since the year of 1985, Petra has been referred to as a “UNESCO World Heritage Site” – which means that it is considered to be a location that has very special significance as far as cultural aspects and physical distinctiveness. Examples of other locations that are considered to be “World Heritage” locations include, but are not limited to: The Everglades National Park, The Statue of Liberty, the City of St. George in Bermuda, and the City of Caral-Supe in Peru. A Swiss based explorer by the name of “Johann Ludwig Burckhardt” introduced the City of Petra to the world in the year of 1812. An individual by the name of “John William Burgon” wrote a sonnet about location and described it as “a rose-red city half as old as time”. In historical documentation, the lost City of Petra is described as being the capital of the people known as the “Nabateans”. The red mountains that make up this city are considered to be the best historical notation of the race that once inhabited them. While the vast structures that define the physical distinctiveness demand the attention of all that visit them, they actually require nothing in return except a high level of appreciation for the unique collaboration of both man as well as nature. 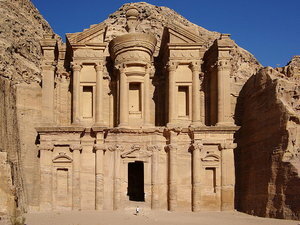 When it comes to Jordan, the lost City of Petra is considered to be the most valuable of all treasures that it possesses. Because of this fact, it draws more tourists than any other location within the country. The Nabataeans – who are considered to be an Arab based civilization – are hailed as the intelligent party behind the design of the lost City of Petra. It is believed that the beautiful structures carved into the rock of the city were created – amazingly – well over two thousand years ago. The civilization quickly attracted many tradesmen to the region. It is believed that their civilization gained an intense degree of wealth based on the fact that they monopolized the trade industry when it came to items such as silk and spices. It is believed that many individuals from neighboring countries visited the ancient City of Petra in order to acquire the goods that they needed and wanted. Countries that were known to visit Petra include Egypt, Rome, China, Greece, India, Syria, and possibly others. Individuals that desire to enter the lost City of Petra must do so through a location known as a “Siq”. This is a relatively narrow area gorge. This expands for approximately one thousand ninety four yards or three thousand eighty two feet. As you walk through this large section of colors and unique rock formations, you will find yourself in awe at the beauty. At the end of this siq, you will immediately see what is identified as the “Al-Khazneh”, which is the treasury of the ancient civilization. Amazingly, the ancient City of Petra is thirty meters wide and has been estimated to be an amazing forty three meters in height. As you look around at what remains of this amazing city, you will quickly find that the civilization that created it are considered to be architectural geniuses. Throughout the lost City of Petra, you will discover many different structures created from the red rocks of the mountain which the city sits on the slope of. One of the most amazing of these structures are the many different tombs that rest within the city. You will find that each is carved with care and interesting inscriptions. As you look within these tombs, you will discover that they are empty – a mystifying characteristic which has stumped thousands of individuals throughout history. There is also a beautiful three thousand seat theatre which has been constructed in a roman architecture style. You will also find many different temples, an assortment of obelisks, as well as many altars upon which many sacrifices were made throughout the ancient City of Petra. The only way people can actually make it to this location, is to take a journey through the As-Siq canyon and head down to the Valley of Moses. It is also along this walk that many people begin to feel like they are taking a journey back in time. This is perhaps another reason that people are enthralled in the area. Along with that, people claim that they also feel a sense of rebirth and spiritual growth in this area. While there have been very few claims of any spiritual healing, there is an open debate on the spiritual significance of this area and all that it can offer to those who are willing to take the journey into the city of Petra . What is certain is that it remains a brilliant city full of color and brilliant architecture that if nothing more can reflect how civilization can survive throughout the course of time, without making significant advancements in the ways that they handle their day to day existence.